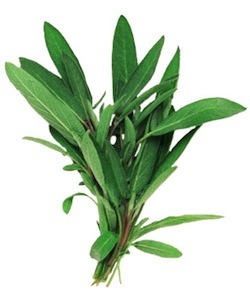 Sage is perhaps the culionary herb with the broadest range of medicinal uses. Salvia officinalis (Common sage, Culinary sage) is an aromatic plant that is frequently used as a spice in Mediterranean cookery and in the food industry and as a traditional medicine for the treatment of several infectious diseases. Some peer-reviewed publications described the positive effect of Sage. Sage may be anti-hypertensive, anti-diabetic, anti-inflammatory and anti-microbial. Some of the distinct effects of sage that have been reported include anhidrotic (prevents perspiration); blood sugar-lowering effects in diabetics; antimicrobial; and drying up the flow of milk during lactation. The primary medicinal components in sage are volatile oils, flavonoids, and rosmarinic acid.